Chris Jericho comes out and welcomes everyone to “Thursday Night Jericho.” He shows a video recap of RAW. Jericho starts to talk about the Rumble but gets interrupted by New Day. New Day says Jericho should be ashamed of himself for murdering Francesca the Trombone. They say that he can be rehabilitated though. They bow their heads in a moment of silence for Francensa. Jericho misquotes Confucius and starts a “rootie tootie booty” chant. He tells New Day that he won’t beat them up because they have a match. He then calls for their opponents. Kofi starts and gets double-teamed by The Usos. Woods tags in and doesn’t do any better than Kofi. Ziggler tags in and lands a nice dropkick on Woods. Woods drives Ziggler into the corner and tags Big E. Big E lands a big splash for a 2 count. New Day starts making quick tags and have taken over the match. Eventually Kofi jumps up to the top rope but takes a dropkick on the way down. Ziggler tags Jimmy who hits a running hip attack on Kofi. New Day uses their numbers to distract Jimmy. Big E hip tosses Jimmy out of the ring to the floor. Big E has Jimmy in an ab stretch near the New Day corner. They start a Unicorn Stampede. Woods hits a kneeling reverse STO on Jimmy. Jimmy nearly makes a tag but Big E stops him. Big E sets Jimmy up in the corner, but Jimmy leaps onto him with a flipping senton. Jimmy makes the tag to Ziggler. Ziggler hits an elbow and a Famouser on Woods. Ziggler is lifted out to the floor but Jey tags in and continues to attack Woods, hitting a Samoan drop. The match breaks down and Jimmy dives to the floor onto Kofi and Big E. In the ring Woods takes a triple superkick. This was a fun match. Good back and forth and some nice moments. The breakdown was quick but fun, and the team of The Usos and Ziggler worked really well. They are all very high energy and it kept the pace of the match up pretty high. Becky gets Alicia down on the mat and hits two running leg drops. Alicia rolls out of the ring and hits a northern lights suplex on the floor. Becky fights back in the ring with a series of clotheslines. Becky hits a kick and an exploder suplex out of the corner for a 2 count. Alicia goes for a body slam but Becky counters it with Disarm-Her. A pretty good match, but the guest commentary was very distracting. It hurt the match. The highlight of the match was probably Alicia’s northern lights suplex on the floor. “Miz TV” with Ambrose and Owens. When Ambrose comes out he tries to take over the show. Miz gets mad. Ambrose threatens to punch him. 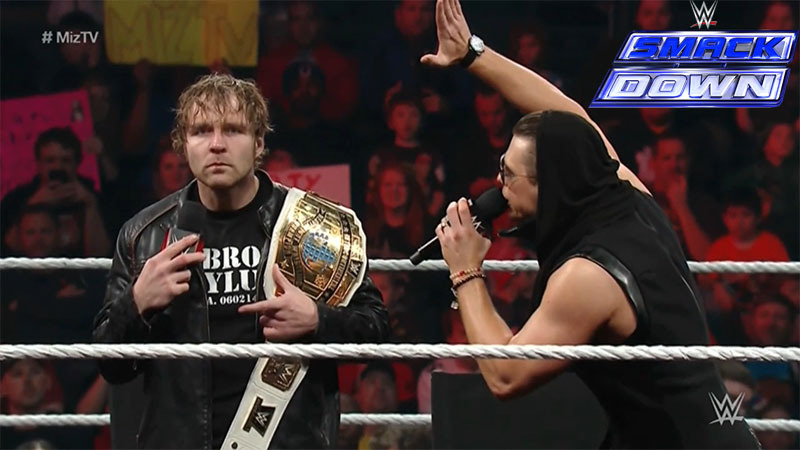 Miz is sick of being interrupted so he just sits down and lets Ambrose take over. Ambrose talks about taking Owens to a carnival of pain and destruction and gives us a tour of the different rides. As he finishes Owens comes out. He says that Ambrose’s carnival shtick means nothing to him. Ambrose tells Owens they can fight right now. Miz takes the opportunity to attack Ambrose from behind. Miz calls for Owens to join him in the ring. Owens powerbombs Miz. He goes for Ambrose next but Ambrose fights back, driving Owens out of the ring. Ambrose hits Dirty Deeds on Miz. Ryback starts strong with his power and speed, but Bray starts to take control with some well-placed strikes. Ryback hits a Thesz press. Bray rolls out of the ring. Ryback follows and gets slammed back-first onto the apron. Bray mounts Ryback in the corner, but Ryback walks out and powerbombs Bray. He hits a side-kick and a big splash on Bray for a 2 count. Ryback goes up top but misses a splash. Bray quickly hits a side slam and a running senton for a 2 count. Bray runs towards Ryback but takes a spinebuster. Ryback hits a Meat Hook Clothesline and sets up for Shell Shock, but the Wyatt Family distracts and attacks. Strowman runs Ryback into the ring steps, then back in the ring Bray hits Sister Abigail for the win. Pretty good. It went about how you would expect. After the ending on RAW there was no way Bray could lose this match, and utilizing the help of the rest of the Family further showed how he expects to win in the Royal Rumble match. Stardust immediately leaves the ring. He gets back in and gets caught. Titus chops him and tosses him across the ring. Stardust leaves the ring again. Titus follows and Stardust runs him into the ring post. Stardust then pushes Titus into the barricade and rolls him into the ring. Stardust tries to continue the attack but Titus’ strength is too much. Titus hits a big boot and an avalanche. Titus goes to pick Stardust up but he can’t because he’s hurt. Stardust hits a DDT for a 2 count. Stardust goes to the top but Titus boots the top rope causing Stardust to fall onto the top turnbuckle. Titus then grabs Stardust on the second rope and hits Clash of the Titus for the win. This was a nice match. These guys have faced each other an awful lot, but I liked some of the variety they added here. Stardust’s attacks on the outside were pivotal in the match and Titus sold them well the entire time. The finish was nice and emphatic. Renee Young welcomes Kalisto. Kalisto says Del Rio is huge in Mexico, but he’s used to being David and fighting Goliath. Del Rio and The League of Nations gang up and attack Kalisto. Roman Reigns comes out for his match and gets on the mic. He sarcastically talks about being the number one entrant in the Rumble and says regardless of that, he’s going to win. Sheamus starts. Reigns pushes him off twice and Rusev tags in. Reigns low-bridges Rusev and runs him into the barricade. Reigns prevents the tag but gets caught by Barrett. Rusev hits a fallaway slam. The League (mostly Rusev and Sheamus) takes turns beating on Reigns. Sheamus tags Rusev but Reigns hits a series of lariats. Reigns sets up for the Superman punch but Del Rio and Barrett grab him from the outside. Sheamus come over and attacks and the ref calls for the bell. Not much of a match really. It was basically just Sheamus and Rusev taking turns in the ring while Reigns put up a little bit of a fight here and there. This was more of a story segment than a match. After the match, the League continues to beat on Reigns. The Usos come out to help Reigns. They get a few shots in but get overwhelmed by the numbers. It does buy some time for Reigns to hit a Superman punch on Rusev and a spear on Sheamus. Suddenly the Wyatt Family surrounds the ring with Reigns all alone. Reigns fights, Strowman is too much for him. With the advantage, the entire Family gets their shots in on Reigns. The show ends with Bray hitting Sister Abigail on Reigns. A pretty good show. Like RAW, there were no big surprises, but the segments were entertaining. I’m not a fan of handicap matches in general, and the main event for this show was no exception. Besides, it’s at least the second time we’ve seen this as the main event for a Smackdown. On top of that, Reigns won both of those matches. I would have liked to have seen something a little more original for the last big show before the Rumble, but I understand that the big stuff always happens on RAW. This match had the best energy and the most fun action. Francesca was missed, but it was still a really solid match.